Mix a scoop or 2 of this deliciously tasting Dutch chocolate protein powder with 10-12oz of cold water following a workout or at times when you require extra protein in your diet. 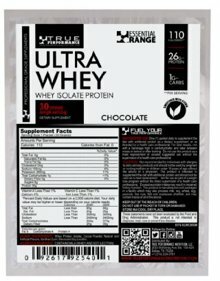 Each serving of ULTRA WHEY is fat free, sugar free, cholesterol free, and sweetened with Stevia, not artificial sugars. And at only 110 calories, you’ll be getting 26 grams of complete protein with 6 grams of BCAA and 4.5 grams of glutamine per scoop, to help assist in the repair and growth of lean muscle tissue. Muscle building never tasted so good!